This big star quilt belongs to Michelle. It's enroute back to her in California as I type this. This large 96" or so quilt is made from mostly Michael Miller prints. 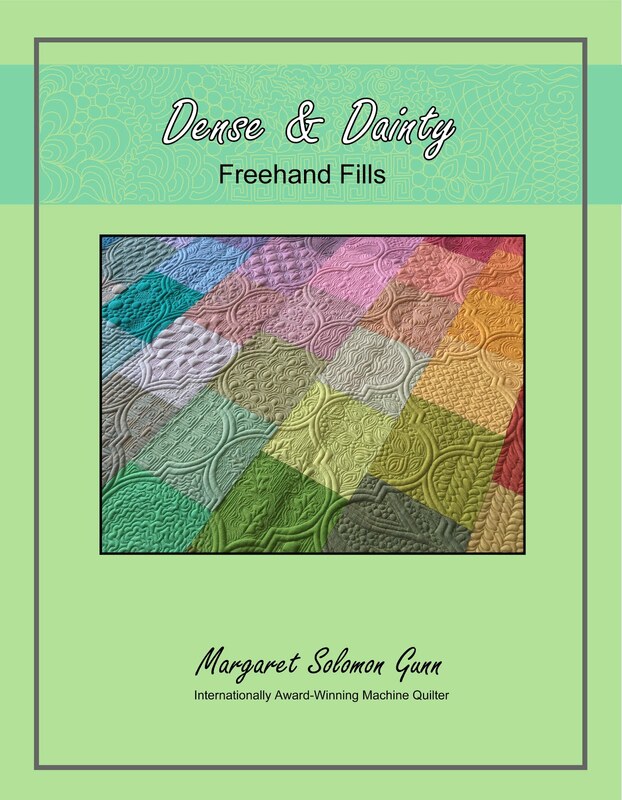 They are very soft and modern, and thinner than many quiltshop grade fabrics available right now. Living in the So Cal climate, she likes the lightness of the quilt. I, personally, found them quite a bit harder to tension. They were more succeptible to causing small tension adjustments. But, that's my problem. The green and pink print below is my favorite. It reminds me of a dress my daughter had. It's a bit more nostalgic than the other modern florals. Michelle basically said "do whatever" (E2E on the body) and quilt something different on the blue borders. Leave it to me to select a pattern that wasn't really all that quick to stitch! The free-handed meandering feathers-nfronds look great, but they took a surprisingly long amount of time - about 2 hours more than I anticipated. They are essentially a scaled down version of the Plumage pantograph. Since I feathered the body of the quilt, I chose something non-feathery for the borders...something to tie in with all the swirly fronds and the flowers on the fabrics. Here is a look at the back...It is a fabric I used on a quilt a few years ago for my MIL. It is actually a soft aqua, with words on it like "family", "peace", etc. The one thing I found challenging with this quilt was thread color selection. I wanted it to look good on the top and backside, since the back is mostly neutral. The back is aqua, while the top is an odd olive shade. When I auditioned aqua thread on the top, it seemed out of place. The top is seen the most, so I want the top to be better. In the end, I chose an muted olive (some may call this baby-poop, but it actually works very well with a multitude of colors!). It blends with the background around the star. To me, this is the intuitive place that the thread ought to "disappear". The downside is that the olive thread is quite evident on the soft aqua backing. Oh well! It does look good, and what's a gal to do when aqua and olive are the colors ?!? The top thread is Superior Omni, bobbin is Bottomline, and batting is Hobbs 80/20. I believe that this quilt will be given to the client's MIL. Last week... (hint: the temperature is in the lower right) Sunbathed on the back patio in the afternoon. Dug out all the shorts. Thought about air-conditioners. Just frightful. I know that it is March 28th, and historically, it's not at all uncommon to have snow still on the ground, but really...After the last 6 weeks of very mild weather, this is culture shock. We've returned to the 30's and 40's and I am having to tell my kids not to wear shorts to school. The news is not met with an ounce of enthusiasm. It does, however, make quilting in the afternoons easier. Even more amusing, the town has been street sweeping this week, which is an assumption that there won't be any more snow. And what is right in front of my house this very minute??! A street sweeper! I have my quilt loaded right now. I am about 1/3 of the way through the monolon ditch stitching to stabilize it. Normally I just dive right in, and do the ditching at the end. But I'm not really sure how long I'll be able to keep it on the frame so I am stabilizing first in case it has to be taken off for customer obligations. I expect I will work on it through next week, until I leave for MQX. Maybe I will show some progress of this quilt in coming days, but right now there is just not that much to see since I am only ditching, and in clear thread! 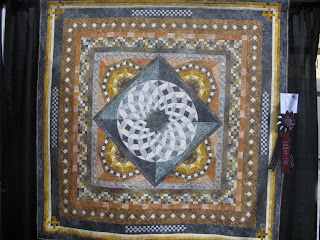 My Cartoline da Venezia (aka Postcards from Venice) quilt (below - photo taken last year at MQS) returned home last week. It was at the AQS Lancaster show, where it earned an Honorable Mention. I was pretty happy to get a ribbon at all when I saw the show photo CD and realized all of the quilts that were in it's large wall quilt division! It will be going to HMQS in May. I finished this lap quilt last week. It is a bit unusual in that the fabrics for the top are sort of canvas-y. They're very bold and graphic. Sorry, I'm not sure who makes these. My first thought was that they'd make some really fun summer placemats. Some prints have animals, and bicycles, and bright cheery themes. The gem of the quilt, however, is on the back. If it were me, I'd have pieced the back and found a single piece of some small print for the top, because the back is awesome. The quilting is in a bright purple 40wt poly thread. It is barely evident from the front. But the purple bobbin is great on the colorblock (made from Moda Crossweaves, which I'm informed may be discontinued???). I chose a simple, hand guided edge to edge with plenty of swirly movement. I should also mention that the thread is new. 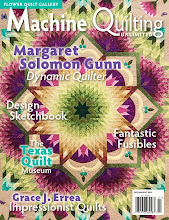 It's one of the Wonderfil Machine Quilter threads I got recently. It sewed beautifully. It has a slight sheen, not as much as the Glide though. I wish this thread was available for order in the fall, as I may have bought more of it with my gift certificate. As it is, I have 15 cones, and if this first encounter is indicative of other quilts, I will like using it. The colors of the back remind me of these sets of silks I have been eyeing (from Brewer), and contemplating splurging on. The fabrics come in great shades of green, blue and purple. There is also a kit with all the red and pinks. Yum! Last fall, I bought some of these (below)...they are September Light from In the Beginning. They are hard to find. I'm not sure if they have not really come out, or just were not mass produced. There are also prints in this collection, but the ombres are gorgeous. I am just now getting around to designing a graphic applique around these. All I need to get started is the background material. I thought I got it Saturday. My 7 year old helped me (probably too much) or I should say, urged me that the dark blue would be a good background. I was leaning towards black or soft tan. I erroneously got 3 yards of dark blue, thankfully at Marden's price of only $4/yard (it's a Henry Glass too). Now I need to go back and actually get a lighter shade of tan instead. But not today...he is home with an upset stomach. Figures! What I found was interesting...Having the purple sections (of the outer diamonds) towards the inside (upper left) left the boundary of the pieced 8 green squares much less defined than when the greens were towards the inside (upper right). This is much crisper to me. I need these pieced squares to be defined and not just blur into the diamonds, like they do in my actual picture above. I also played with the placement of the center diamonds. Teals to the inside or blues??... Placing the teal to the center makes the center not appear as this bright spot, and the light blue points further help to define the 8 leafy squares. So right now, the bottom right is my preferred layout. Today's post includes some quilts that I have done recently but not posted for whatever reason. This first one was actually just taken off the frame yesterday. Becky made this double wedding ring lap quilt for herself from some modern-ish fabrics. The background is a most-nontraditional charcoal. More often, the background is a pale color. She specifically asked for flowers in the open spaces. This was a somewhat challenging request because the fabrics are all so graphic and geometric. I had a harder time devising a floral motif that felt like it belonged on the quilt. In the end, she chose 2 of the flowers I had drafted and had me alternate them in the open background blocks. That color is pretty washed out, but you get the idea. I used a silvery-aqua Glide thread. The color is not as evident in the photos, but the shine is pretty. The next 2 quilts are from a Cali client. They were quilted a month or so ago. Do you recognize a common trend here?... I think she loves blue and red :-) This one is a simple and clean modern design made with strips of variable width. It is edgy and bold. I knew I wanted the Razorgrass pantograph for it as soon as I saw the top. It shows perfectly on the solid blue fabrics. I think I used a white Omni thread for this quilt. Julie's second quilt is a sampler of sorts. It is made of many star-like blocks, with a center medallion block. It is actually for ner nephew so I didn't want anything too feminine. I chose a red thread (top and bobbin) to help bring out the small hints of red on the top. As you see above, the backing is black, so the red shows there, bringing interest. Julie selected the Plumage panto. It's kind of a semi-generic edge-to-edge, without being too girly. All of the loops and curls help to soften the many linear lines and straight-edged geometries on this quilt. And now to Lynette's Patriots and Petticoats. Stats...98" square. It has wool batting, and is stitched with 3 colors of Superior's Omni thread. This is their newest thread, and is a 40wt polyester. It has a dull appearance, like a cotton, and seemed appropriate for a quilt that would have been quilted with cotton thread 170 years ago. My hallway prohibits me from showing the entire quilt, but one of my previous posts gives a link to the entire quilt. 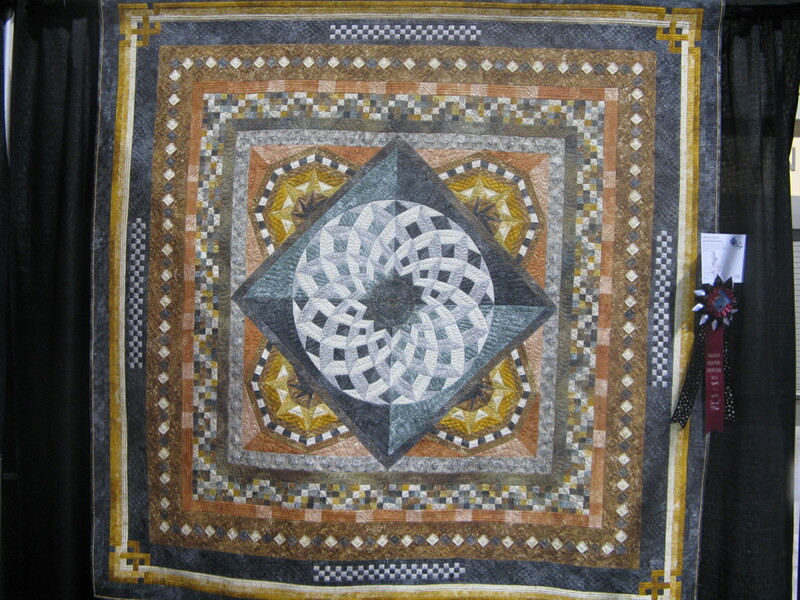 This is a nice layout for this style of "scrap" quilt, as all 1840 reproduction quilts are. 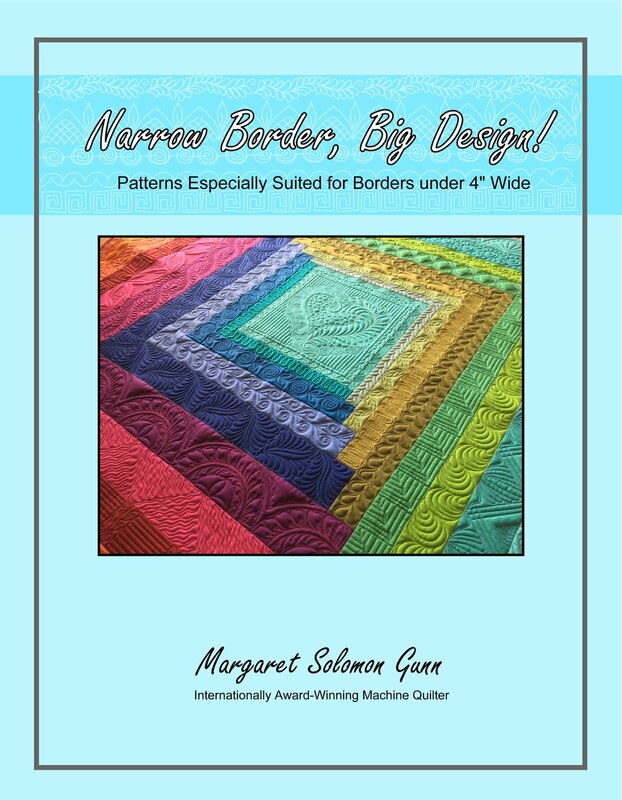 Some designs just don't leave much room for quilting or show cohesion between the many pieced blocks. I chose to break up the center background slightly with an outlined square on point, with feathers inside of the band. The inner section is straight cross-hatched. It seems really simple, but it is so classic to this period, and lets the focus be on the center medallion. The medallion is where I may have deviated from pure Civil War tradition a little. I kept plenty of feathers, but added a few swirls here and there (to fill those pesky points), and created tulips from the tulip piecings. 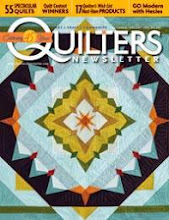 Hopefully I will be forgiven for not quilting purely to the 1840 period. Another thing I did that is a little out of character for me, is the feathers are stitched in contrasting thread (sage on the cranberry). It limits the thread changes, and allows them to show creatively. I like it. The borders have single scallops, piano keys and a feather filling. Simple (well, comparatively!) and effective. The ribbon border is accentuated with straight lines and feather back-filling. The logs were only supposed to be outlined, but I made a couple wrong turns on the first set, and ended up cross-hatching all of them in the end. It looks just fine; no regrets. Everywhere else has lovely curving feathers and curved-crosshatching. Yum. It's amazing how much better the quilting shows on this quilt than it did on the previous repro quilt I did - mostly because the color is so much lighter. 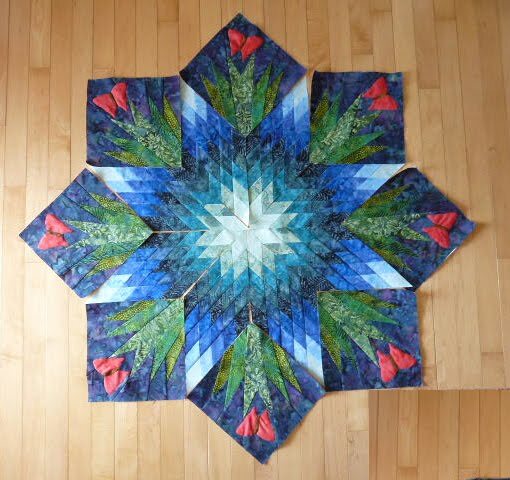 Each of 16 pieced blocks were stitched with a feathered wreath. I did not want to do each differently. I don't think that is as effective (or representative of CW quilts). When I saw the back, I knew that this was the right choice. The backing is pretty. I like when backs show the lovely texture. Those feathered wreaths just rotate so serenely! And the scalloped border is so pretty from the back. I've got several simpler (mostly E2E) quilts to fill my time for the next 3 weeks. I am so psyched about getting out of here to go to MQX - Will April 10th just get here??! It is a freakish "spring" here in the northeast. Some years, it seems as though spring has not come until late May or early June. This year, we have had more days that have hit 50F in February and March. It is already 60F today. I'm not sure I can quilt this afternoon with temps like this. Because I am nearly finished with this quilt...maybe another 3-4 hours of finish-up work, I envisioned not having more sneak peeks until it came off the frame. But I am dallying today, so here's a looksee of the center, albeit the red part is not completed. Ok, and another look at the quilting on the body of the quilt. There's no shortage of cross-hatching and feathers. Here it is! Last May I won $1000 in thread from Wonderfil at MQS. I had never used their thread before then, and had only heard of Invisifil, a 100wt very fine thread. I have used that thread a good bit, but only dabbled with their others. Last week I decided to cash in on the last $500 of that gift certificate. I got 15 cones of their Machine Quilter thread (40wt poly), 5 cones of a 50wt cotton that I will likely sell since I don't use cotton hardly ever, 4 cones of a nice metallic, and a few of this and that. The thread is rather pricey compared to Glide, YLI Professional, and most of Superior's (at wholesale prices) - it comes from Canada. I plan to try out the 40wt poly on my next quilt. And here is a little sampling of another quilt coming up for next year... I am making another broken/carpenter's star. It is all in water colors. The appliqued butterflies are perhaps a tad dramatic, if not unexpected, but they will be that pop of color that will be needed. 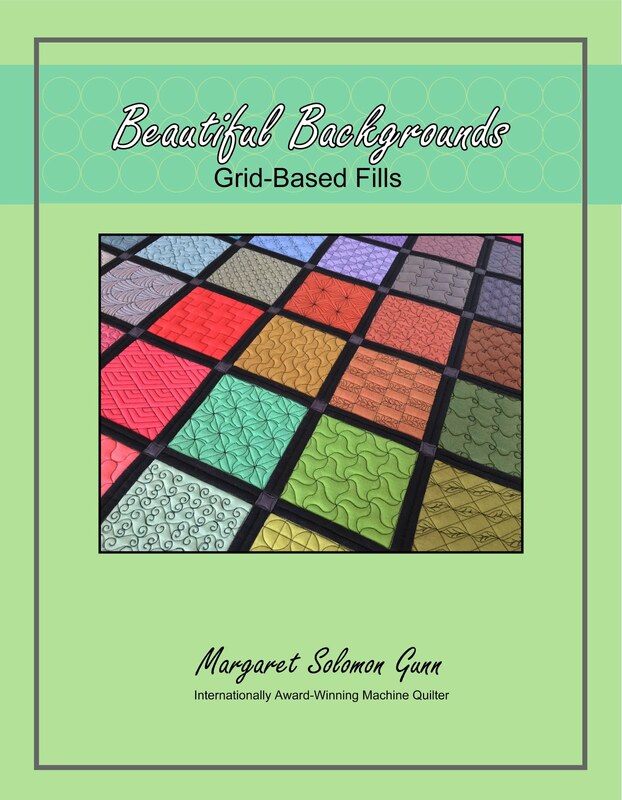 I am currently designing the setting squares for the next round - there are 16 of them! I have fabrics for the diamonds, but who the heck knows when I will have time to get them pieced (summer???). The work rarely stops here! I am onto my next quilt...it's a 98" 1840's reproduction quilt called Patriots & Petticoats. This is actually the whole quilt if you want to see it. It has nice light fabrics, and a good bit of open area for a longarmer to play in. I started it 3 days ago, and am about 1/3 done, if my hourly estimates are correct. I am within sight of the center, but probably another 3-4 before I am truly half-way. I just love the border fabric. After seeing it, I thought about some swirling leaves, following the design of the print. The client had really liked an initial suggestion of swags and piano keys, so I opted to go with this. I stuck feathers in the smallest space under the first swag. I may go back and do parallel lines on either side of each piano key to jazz up the outer border a bit as well. I'll do this all at the end so there's not so much stop and go. As you may be able to detect below, there are corners of curved cross-hatching, meandering feathers, and then, more feathers. Yum! It's hard to see the madness to my method in only a 20" segment, but I am breaking up the background fabric to partition a feathered diamond in the quilt's center. There is a lot of feathering on this one. Even the 20 all different pieced blocks got feathered wreaths. It just seemed more cohesive than all the stencil ideas I was testing. The very center background is very appropriately, straight cross-hatched on a 1" grid. It may seem a little bland right now, but I think it will be quite cohesive when the entire quilt is visible. I have contemplated adding cc's to the hatching, but I think that will be overkill. Better to change my mind later, than to pick it out for 4 hours now! The ribbon border is delightful. It is simple, elegant and quite consistent with 1840. Visual straight lines at 1/2" spacing and feathers. The narrow borders are not yet ditched, nor are the logs. Patience...in due time. Tomorrow I will be most likely conquering the center medallion. I'm on the fence about what to do with the ivory background on it. The quilter in me wants to McTavish or pebble it, but the 1840's ladies would never approve of such a frivolous waste of thread. I must keep thinking. Somehow a straight cross-grid just seems too mundane! I just finished the Civil War Chronicles Quilt (designed by Homestead Hearth) this past weekend. It is completely huge - around 112" square or so (see quilt here), and is made with marcus fabrics. I can't begin to take a picture of the entire quilt so you'll have to look at it in the link. I'm by no means a huge fan of the reproduction fabrics from any era, but these were particularly difficult to quilt on because they are very heavily patterned. I wondered when the quilt was done if my intended quilting scheme would actually show! Here's the quilt on my raised queen bed, nearly draping all the way to the floor (over my 100" square quilt!). The center of the quilt...Lots of ditch quilting, curved cross hatching, cc, and feathers where I hoped that they might show. Under the right lighting, they do. There are 16 of these small-ish (~6-8") blocks around the outer flanks of the quilt, eight of each block. I was happy to discover that despite the blocks being different, it was rather simple to devise a reasonably simple stitch pattern that was the same and worked for both block designs. This quilt has a nice Hobbs wool batting so over quilting was not desired. Besides, I wanted to keep it somewhat "period", and avoid things like pebbles and meander stippling, etc. The monstrous borders are what is shown below. I like the feathered triangles, and think that they work well. 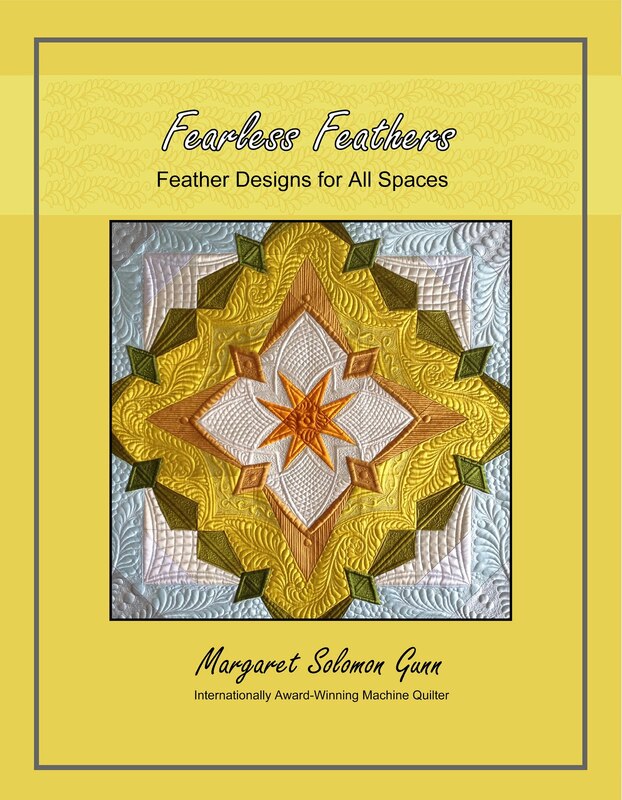 Any areas that had minimal piecing had quilting more tailored to show, such as feathering. The four corners of the quilt are comprised each of 4-13.5" (yea, my eyes rolled also) blocks. As I said earlier, each of these has a different construction geometry. To keep the cost more manageable, we opted to do a E2E filler in these 16 corner blocks. I think this was a good decision. I wanted to do Baptist fans really bad, but I do these with templates and they just do not fall into E2E pricing. Instead, I subdivided each block into quadrants and did free feathers down the diagonals. This shows more evidently on the back. 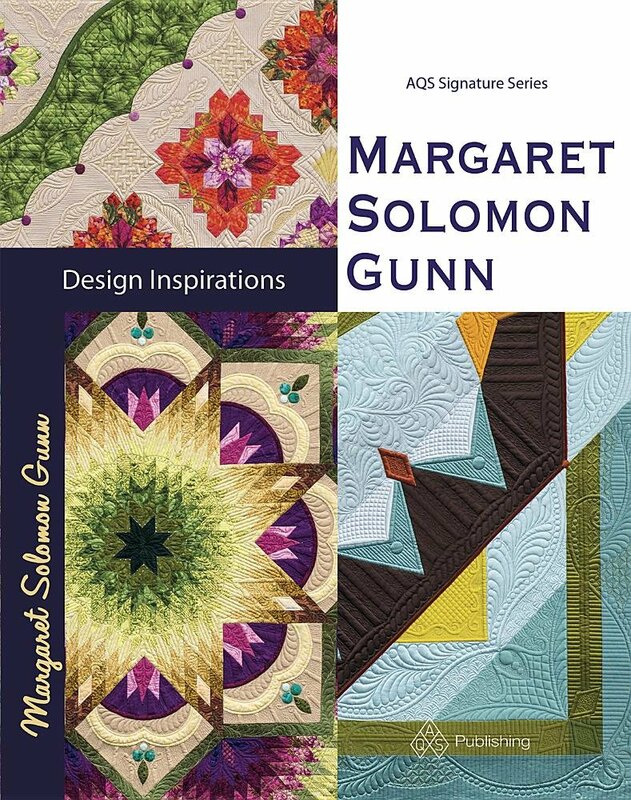 It creates a nice texture, and is not out of context with the genre of the quilt. For those curious, I used Superior's So Fine thread on the top and Bottomline on the bottom...4300 yards to be exact. We are getting our 2nd snow day (that results in a school cancellation...we've had a few more snowy days than that, but not many) of the season. Kids are home, as predicted. You all know my thoughts on kids home, so I won't digress too much there. I have been treading water sort of this week. I quilted on the monster quilt (see previous posts) until Monday morning, when I ran out of the prewound bobbins. I was anticipating this...the order I placed last week did not arrive until yesterday at 5pm. Sigh... Though I'd like to have been finishing the 115" CW quilt, the extra 2 days did allow me to putter with a few other things. I have given my left wrist a nice rest and today I realized for the first time that it was not bothering me. Thank Goodness. Aleve and a wrist brace to the rescue. It has a more art nouveau look, which is where I am going, and is much more how I envisioned it to look. I am now fine-tuning what is going in those star points, and contemplating thread color(s), as I will likely purchase some Glide at MQX for the quilt. With all these colors, I really don't know what color to stitch, but I do know I don't want to change the thread 12 different times! If you have a moment...have a look at the outer border of the quilt...it requires opening the link to see the entire top. I need suggestions on what to do with the quilting for the outer border. I am stumped!